“Think he’ll make anything himself?” asked Mother Hen. 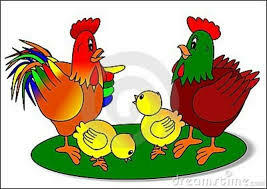 While nosing her chicks toward Farmer Brown’s corn and barley grain, Mother Hen considered her husband’s statement. Indeed, after the recent election of Ms. Sarah Green-Peas (no relation to the Jolly Green Giant of frozen peas fame), there seemed no limits to what the American people might do. If Ms. Green-Peas, a belly dancer from New Hampshire, could capture the heart of the nation, then there was no reason her chick might not do the same. While nosing her chicks to the pond behind Farmer Brown’s stately grey slate mansion, Mother Hen considered her son’s statement and wondered where he could have learned so much about political economics. Last she knew, neither Harvard nor Stanford accepted chickens for full matriculation although, interestingly, Notre Dame had just taken in a lamb. Although she really didn’t approve, Mother Hen cooked the eggs to perfection. She was a good wife and mother. But she had always wondered if there might be something wrong with a man who was prepared to eat another’s children? She hoped Ralphie wouldn’t grow up to be like his father but she supposed that he probably would.